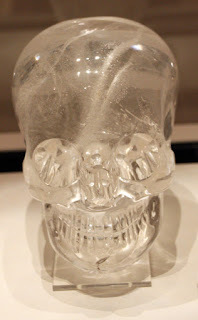 Let's face it, there's been a load of cobblers written about crystal skulls in the past and in terms of fakes and forgeries they are up there with the Loch Ness Monster. However, few can deny that crystals skulls look awe-inspiring and even the histories of the forgeries are amazing tales. What's more, plenty of people find them brilliant to use for scrying and channelling as well as for a focus for shamanic journeying. If you want to read a really sensible book about the history of crystal skulls and how to use them psychically, then I would recommend the new Crystal Skulls: Ancient Tools for Peace, Knowledge and Enlightenment by Judy Hall. It is straightforward, well researched and very informative on the facts and fiction surrounding the world's famous crystal skulls and on how to use the type you can easily buy in shops or online. Crystal skulls are human or other skull carvings often made of clear or milky white quartz or other semi-precious materials. Some are allegedly pre-Columbian Mesoamerican artifacts. Several, more recently carved, can be found in the permanent collections of a number of world-class museums, including the Smithsonian and the British Museum. In occult and metaphysical circles, the skulls have magical and healing qualities. Obviously, the jury is still out on whether those "allegedly pre-Columbian Mesoamerican artifacts" are genuinely ancient, and Judy Hall is not trying to claim otherwise. Her field of expertise is the use of crystals for healing, personal development, psychic and magical work. She is the author of numerous books on crystals, including the famous Crystal Bible series. That is also where this book really shines, giving clear and straightforward instructions on how to choose a crystal skull, how to cleanse and attune to them, and also various ways of working with them. 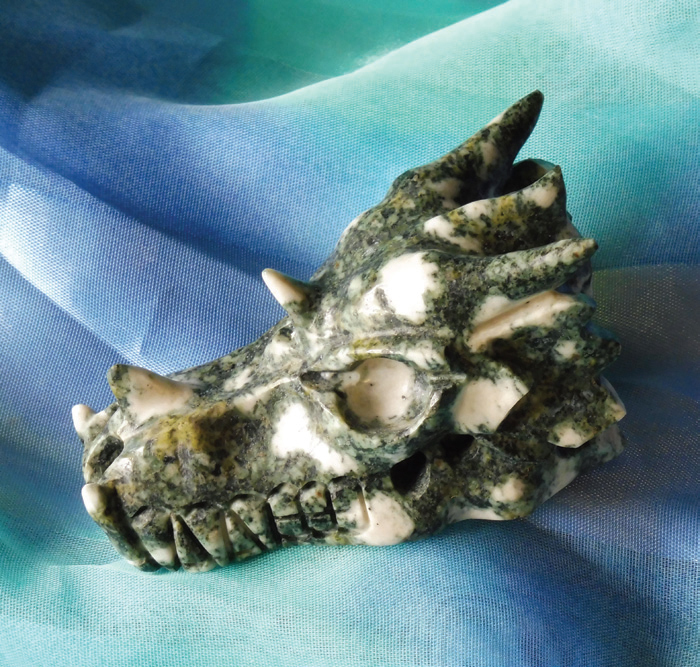 Not all crystal skulls represent human heads - some are carved into the shape of animals or mythical beasts. One example is the dragon crystal skull you can see in the photo on the right, which belongs to Judy herself. A chapter at the end of Crystal Skulls explains how these can be used to help connect with power animals and tap into the symbolism of magical creatures. I have to say it has made me want to do some mystical shopping this bank holiday weekend and maybe buy myself a crystal skull. I've never tried scrying with a crystal skull before and I am keen to give it a go. Photo credits: The photo of the crystal skull in the British Museum was taken by myself, Lucya Starza. The dragon crystal skull picture was taken by Judy Hall. If you want to reproduce the photos, you must credit myself and Judy respectively.